I'm happy to find this photo in my computer. It was taken many years ago, after I have finished and washed this cross-stitch project. I learned cross-stitch in high school and it came to a point when I would spend my free time cross-stitching, and my extra money on patterns and DMC floss. I remember summer vacations by the cross-stitch projects I finished. 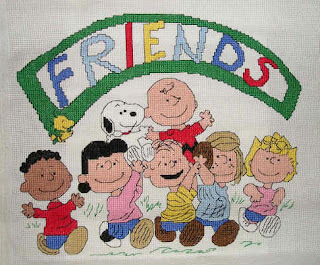 Do you still have any of the snoopy / peanuts cross stitch patterns? Are you interested in selling them? mcinernc@gmal.com i do a snoopy tree every year and need a snoopy tree skirt to complete it.